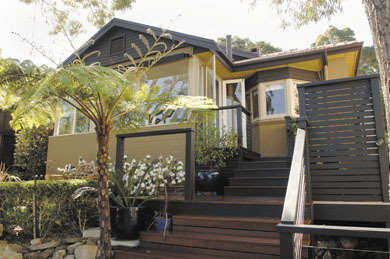 Our smallest and most exclusive harbour suburb is also one of our ‘best kept secrets’. Bayview Street is arguably the peak location for privacy and quietness within this sought after enclave. With views across tranquil waters and the CBD just minutes away you will delight in this rare offering. light and gentle sea breezes. A short stroll of approx. 100m via an easily accessible path, a flotilla of yachts floats on the deep waters of Woodford Bay. This makes it simple to maintain your own sailing boat or cruiser. The public foreshore area is a prized lifestyle feature that can be enjoyed by family and guests. The quality residence has been renovated extensively yet still provides scope for further improvement. Enter via a discreet portico and be refreshed by high ceilings and a sense of light and space. The inspiring professional chef’s kitchen is the nerve centre of a home that flows for both formal and casual living. The sitting room with fireplace and separate dining adjoin a warm sunroom with ample glass to drink in the views. This extends to a purpose built sundeck – a summer time special! Two bedrooms and study on this level access a full size luxury bathroom with heated floor. A huge family room opens to the private rear terrace with water feature and steps up to a level rear yard with room for a pool. Upstairs, the master bedroom is serviced by a dressing room and spa ensuite, a gallery adjoins another double bedroom with walk in robe. A strongly built, well maintained property of distinction wouldn’t be complete without an air-conditioned, secure wine cellar. With 2000 bottle storage you will be set for entertaining! of private and public schools all within easy reach.